Discussion in 'Mac OS X Lion (10.7)' started by monkeywalker, Jun 5, 2012. Carefully follow the instructions here step by step and it should work. If you are getting that error message after following these instructions you may have a corrupted download and will need to redownload. But, the other options: Information, First Aid, Erase, and Restore. I can't see do I have to set an option in The OS somewhere. I think they are using Snow Leopard there, and that is why the difference. In place of that drop down, just click the Restore tab to the right. This page makes it more clear. I've followed the instructions as you suggested but I still get the same error. I will download OSX Lion again and see if this works. Downloaded OSX Lion again still no luck can any expert advice? Hmmm... how about trying to use this app to make the USB key for you? That will take all the guess work out of it. Have you formatted the USB key in Disk Util as Mac OS Extended? thanks weaselboy that worked a treat, and thanks Lionmaker 1.7. Yay... glad it worked out. Hi, wonder if anyone can help please. I have MBK Pro gen 1 Intel, and have had to replace hard disk, the DU with Tiger does't like the block size on the disk and presents it as 8 x more than it is. Reading suggest booting from a newer version of OSX and have create a boot USB for Lion. do an alt power up with it in and it presents the Lion installer, click and it eventually goes to the no entry sign and switches off.. I suspect this is because the drive is not partitioned or formatted yet. So how do I get to the DU on boot up to do that with the Lion USB? So how do I get to the DU on boot up to do that with the Lion USB? 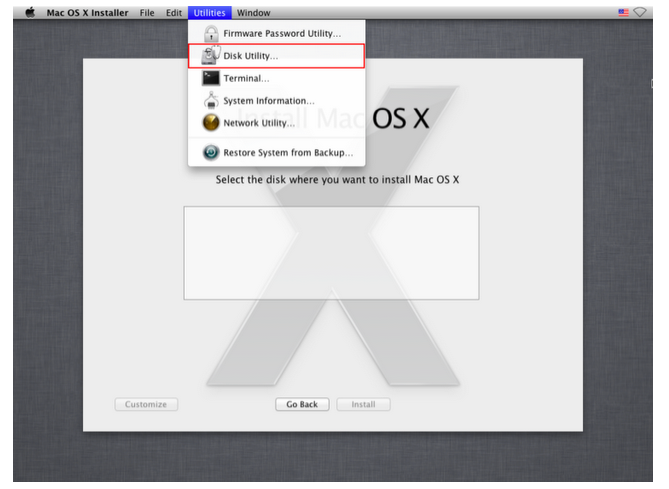 Once you get to to the installer screen click on the Utilities menu at the top and there you can select Disk Utility. Thanks, but not sure I'm getting that far.. On the alt start I get the Lion image in the a square box in centre screen and a circle with an up arrow in it with the words "EFI Boot" in between, i click on the disk and it disappears and is replaced with the no entry sign and then eventually switches off..
After you do the option key start and select the Lion install USB key, you should get to this screen and select Disk Util as shown. If you can't get that far, you may not have created your USB install key properly. Even with a completely trashed hard drive you would be able to get this far off just the USB key. That would be my thought at this point. Even with a completely blank drive installed you would still be able to boot from the installer and get to the screen I showed.